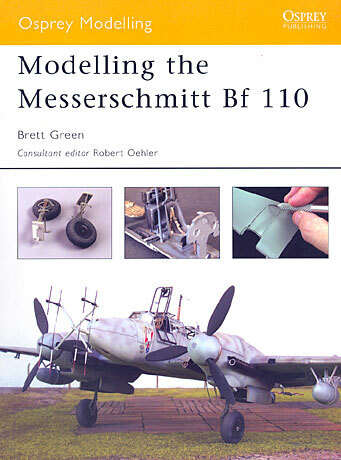 Osprey Publishing's book in the new Osprey Modelling Series, "Modelling the Messerschmitt Bf 110G" by Brett Green, features four detailed construction chapters with 1/48 scale models by the author and by Chris Wauchop; a Gallery of additional Bf 110 models; an examination of 1/48 scale kits, accessories and decal available today; a summary of Bf 110 variants; correcting some common misconceptions plus a chart of typical camouflage schemes. 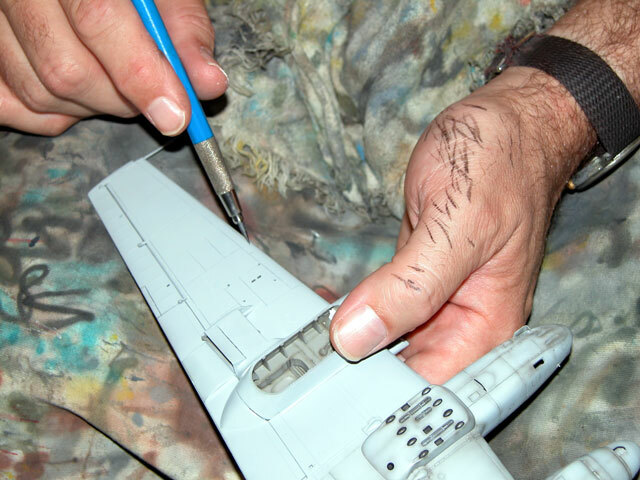 In this Chapter, Chris Wauchop builds ProModeler’s 1/48 scale Messerschmitt Bf 110G-4 with only minor corrections and detailing. 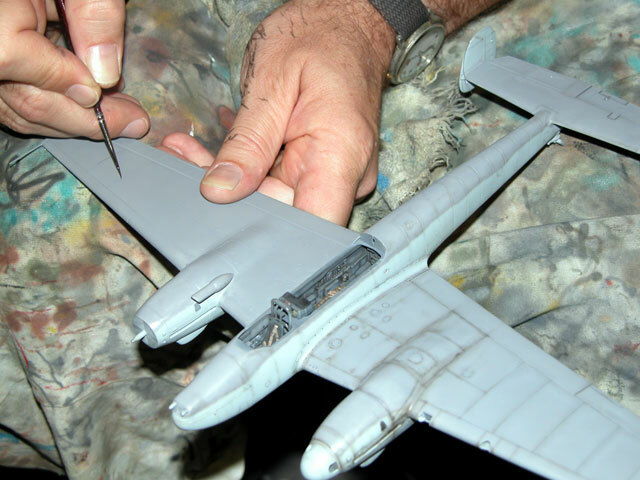 The objective of this undertaking is to take full advantage of kit detail by careful painting and weathering. This small extract from the Osprey Modelling Series book, “Building the Messerschmitt Bf 110”, covers the painting and weathering of the model after construction. Seven photos are included in this extract, but the complete Chapter in the book contains 22 captioned images. "Modelling the Messerschmitt Bf 110G" is available online from Osprey Publishing's website, or worldwide through specialist bookshops and online outlets. The subject aircraft sported a typically simple late-war finish of RLM 76 Light Blue on the lower surfaces, and RLM 75 Grey Violet on the upper surfaces. References seemed ambiguous about whether this Bf 110G had a mottled fuselage, or whether there was a simple, high demarcation between the colours. In the end, a compromise was decided in the form of a very sparse mottle of RLM 75 Grey Violet over the 76 fuselage sides. There are many ways to approach painting and weathering. This aircraft was destined to be post-shaded. Highlighting of structural details and weathering would be added after the basic camouflage colours were applied. Gunze acrylic paints were used for both the camouflage colours. The Gunze RLM 75 looked too dark during test-spraying, so it was lightened with around 15% RLM 76 Light Blue RLM 76 Light Blue and upper surfaces RLM 75 Grey Violet. The airbrush was the usual Aztek A470 fitted with the tan-coloured “fine line” nozzle. Cockpit and wheel well areas were masked before spraying the lower surfaces. Demarcation lines at the wing roots and upper fuselage were not masked. They were sprayed freehand. 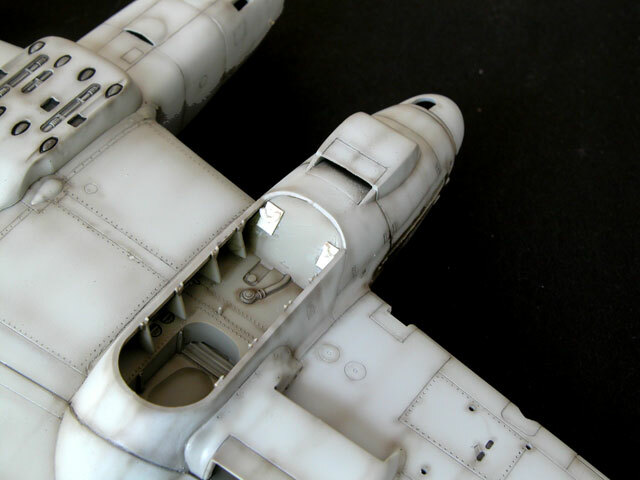 Light mottling was also applied freehand on the fuselage sides. At this stage the model looked quite bland. Post shading added some character and depth to the paint job. The basic camouflage colours were sprayed on the airframe. This simple colour scheme comprised RLM 76 Light Blue lower surfaces and RLM 75 Grey Violet upper surfaces. Gunze paints were used, but their RLM 75 was lightened with RLM 76. The panel lines have not yet been shaded with a different colour. The effect seen here is as a result of a heavier coat of the basic colour being applied along panel lines. It is easy to overdo panel line shading under any circumstances, but it is especially risky over very pale colours such as RLM 76 Light Blue. A 2B clutch pencil was used to lightly draw along the panel lines and structural features on all the surfaces painted RLM 76. This results in a more subtle effect than a wash of black paint and is also more forgiving, as an eraser can be used to remove any mistakes or heavy lines. A sharp 2B pencil is used to lightly draw along the panel lines on the lower surface. For pale colours, this method has a more subtle impact than a black wash. When the panel lines were drawn-in, they received a very thin airbrushed shading of a brown/black mix (Tamiya XF-1 and XF-64). 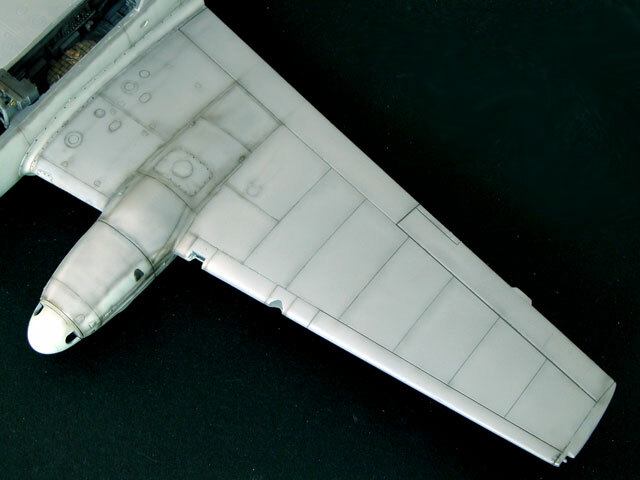 In addition to panel lines, this thin mix can be sprayed into the crevices between nacelle and wing; and the edges of the radiators and oil coolers. 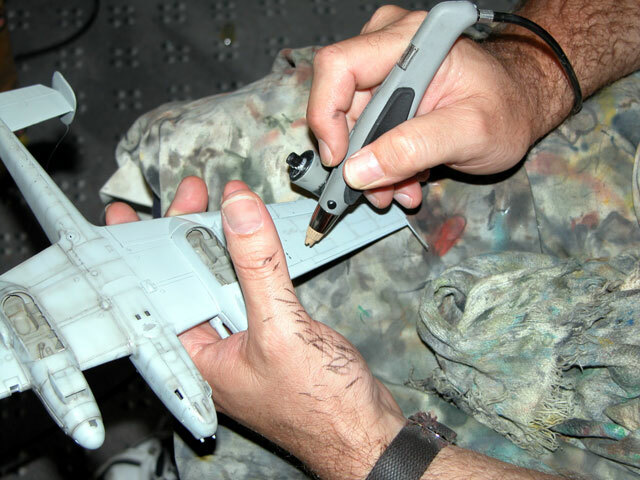 The airbrush is used to trace over the pencil lines with a very thin mix of brown and black paint. Always keep in mind that the emphasis is on subtlety, so make sure that the airbrush paint mix is very thin - almost transparent. Darker camouflage colours require a different treatment for panel lines. The panel lines on the upper surfaces of this model were painted with a thin mixture of Tamiya X-18 Semi-Gloss Black and water. The semi-gloss paint seems to flow nicely into fine panel lines. It is important to note that this is not a sloppy wash – the heavily thinned paint is directed into the panel lines with a narrow brush, but capillary action will tend to draw the watery mixture along the lines with minimal effort. Panel lines on the upper surface are first painted with a wash of Tamiya Semi-Gloss Black, heavily thinned with water. Once the initial highlighting has been completed, the panel lines are given the same treatment as the lower surfaces with the airbrushed brown/black mix. Next, as with the lower surface, the panel lines are shaded very lightly with the airbrush. Exhaust stains were added by gradually building up layers of the brown/black mix on the wings. Paint chipping on the wing walkways and around filler hatches was depicted with the point of a sharp silver artist’s pencil. Without modification, the kit undercarriage legs lean too far forward. The forward mounting holes for the gear legs were patched with styrene and new locating lugs were glued in a lower location to reposition the angle of the undercarriage. The semi-circular lugs were sliced from styrene tube and cut in half. The rusty exhausts were painted with, perhaps not surprisingly, Gunze Rust. Decals for this aircraft were sourced from Aeromaster sheet 48-322 – Nocturnal Birds of Prey Pt. III. This aircraft was not fitted with the oblique-firing Schrage Musik cannon in the rear cockpit, so the canopy did not need the holes for the muzzles. Unfortunately, the holes are present in the optional open rear canopy. An alternate rear canopy section without the holes is also supplied with the kit, but this has the rear hatch moulded shut. The hatch was carefully cut out of the clear plastic with a new scalpel blade. When this slightly frightening task was complete, the glasshouse canopy was masked with strips of Tamiya masking tape and the canopy frames were sprayed grey. Once the masking tape was removed, rivet detail was painted on the inner surfaces of the hatches with Flat Black paint. 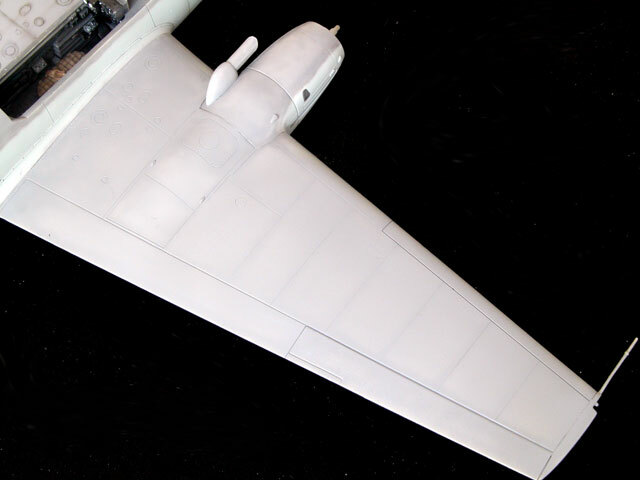 Strut and hinge detail was added to the pilot’s top hatch using styrene and stretched sprue. The airframe was sprayed with Gunze acrylic Flat Clear. A ring and bead gunsight for the MG81Z twin rear machine gun was sourced from an Eduard photo-etched detail set. The completed gun was glued in the rear of the cockpit then the canopy was secured with G-S Hypo Cement, a strong, transparent jewellers’ glue ideal for clear parts. A length of smoke-coloured invisible mending thread was glued into a pre-drilled hole in the fin prior to painting. This was now attached to the mast and a lead-in wire fed into a tiny hole in the fuselage to complete the project. 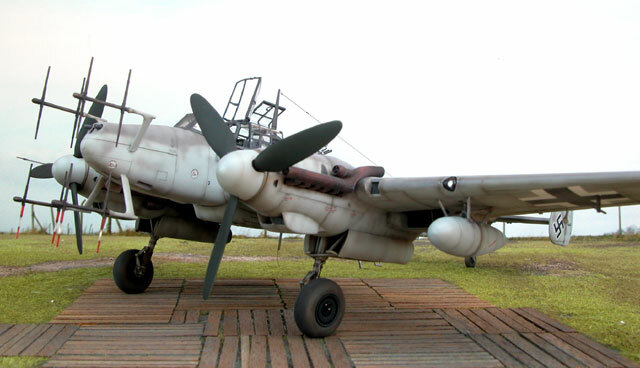 This ProModeler Messerschmitt Bf 110G-4 delivers an impressive result with minimal after-market enhancement.